After seven months in Guatemala, I am still trying to figure some things out. Thankfully, I had good friends explain to me some Guatemalan facts…that are different than everywhere else! Since I arrived, and gradually, I identified and try to understand three things that are strange (to say the least), and I am still trying to figure out a fourth mystery. 1-Places in the “coast”: I had the idea that a coast place is close to shore, to the sea…but not here. The coast is a general area of the country with departments that some miles away are in contact with the shore. So, from the Pacaya volcano in Antigua, we are seeing the “coast places” but not at all the sea! When they mention this, I started looking for the ocean, but my eagle eyes were not strong enough. 2-Sumer and winter: Coming from two countries with very marked four seasons (Argentina and Canada), I find it difficult to understand the weather changes here. For me, it is actually a long “nice climate” plus times with more rain or more wind. Finally, I understood that here there are two seasons (without a marked beginning and ending date) that are mostly dependent on the rain. Winter is the rainy season, from May to October (yes, I remember all the rain) and summer is the dry season, from November to April. But they say the seasons are not that marked now, with the climate changes that we are experiencing. These days, we are definitely in “windy season”. 3-Breakfast and dinner: Typical breakfast here is very nice: eggs cooked as you wish, fried plantains, white cheese, beans, guacamole, a chili or tomato sauce, fruits, tortillas or bread, and coffee. How big was my surprise one evening, when I was invited to a dinner in a hotel and they served me breakfast! When I asked, they told me, that it was not the same, this was called “typical dinner”, and the other one “typical breakfast” because it was served at different times of the day! Of course! As they say in Asia… »same, same, but different ». 4-Maximón: He is a folk saint venerated by the Mayan people. 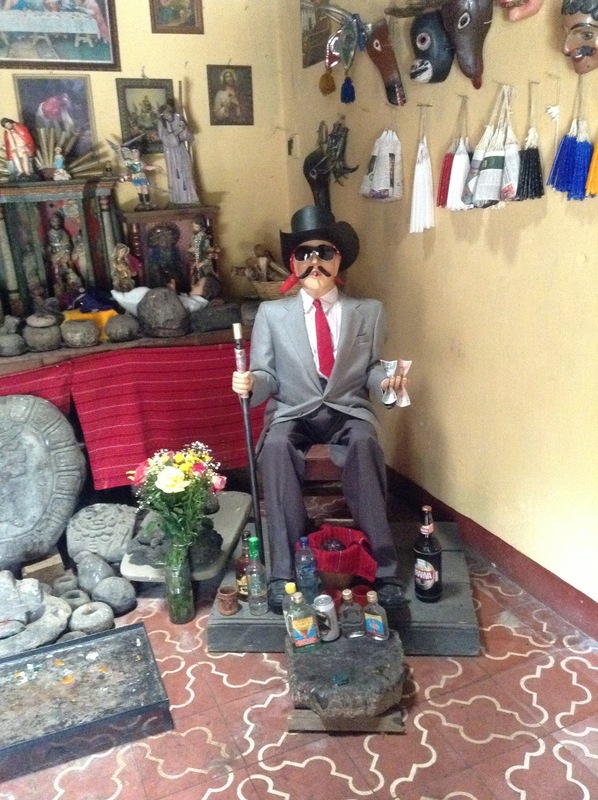 In some towns like Santiago Atitlán, they have a special chapel, where people can make offerings of alcohol and tobacco, pray in the company of a Shaman for a particular favour, or give thanks for a favour already received. What is a mystery for me are his origins. I have heard as many theories as people have explained it to me: he is a form of the Catholic San Simon, a Mayan God called Mam, a mix of the two (the name Maximón may be a combination of Simón and Max, the Mayan Mam word for tobacco. ), a representation of Judas Iscariot in Holy Week carnival rituals, a man that behaved badly, so other people cut his arms and legs, and later he became a God, a man possessed by the gods, or a creature made by the ancestors. If his origins are this mysterious, more so are his powers, but for certain, he is the most folkloric of the saints. Beautiful and charming Guatemala has so many interesting things, I still have a few more time to discover and learn it all!